It’s a personal page of the painter Mikhail Borisovich Mikhaylin. Mikhail Borisovich is a member of the Union of Artists of the Russia. He is also a member of the International Federation of Artists under the aegis of UNESCO. 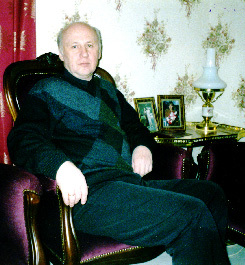 Mikhail Borisovich was born in 1947 in Moscow . He went to the Arts and Crafts trade school also known as Stroganov school. His pictures and sculptures are made in the realistic manner. At the beginning of his career Mikhail Borisovich assisted in the art exhibition of VDNKh in 1970. From 1990 Mikhail Mikhaylin worked in the Moscow-Incite company as the chief painter. He had several exhibitions in Italy . And one picture were presented to the mayor of Rome . In 1995 Mikhail Borisovich worked as the chief painter in the heraldic department of The Federal Border Service. Under his leadership the decoration of the Battle Hall of Fame in the Central Officers House of the Federal Border Service was held. In 1995-96 Mikhail Mikhaylin assisted in the opening of the art exhibition in Pechatniki. In 1995-96 he assisted in the exhibition of artists ‘ work organized by Goethe Center under the aegis of the German Embassy. In 1996 Mikhail Mikhaylin had the personal exhibition in Finland , where his pictures and sculptures were shown . In 1997 he designed and manufactured the emblem for the Moscow City Duma. In 1997 Mikhail Borisovich designed and manufactured the emblem of Railway Troops’ Russia . In 2005-2007 he worked as a main specialist of the art department of ROSTO ( DOSAAF ) and designed their sketch emblem. In 2007 Mikhail Mikhaylin manufactured the bust of thrice Hero of the Soviet Union Alexandr Ivanovich Pokryshkin on request by ROSTO ( DOSAAF ).